Everything happens in it’s own season. Seeds fall, sprouts grow, flowers bloom, fruit ripens, matter decomposes. Life happens. Especially with weeds. Those invisible weed seeds are just hiding out everywhere, waiting to pop their tiny green heads into the world and thwart us gardeners. But even tomatoes will grow where tomato seeds have fallen, whether we want them to or not, if the conditions are favorable to them. Life is undeniable. As gardeners, we try to orchestrate conditions to be favorable to our needs, the needs of producing food and flowers. Our actions can have some influence over the seasons of things, to a certain extent. We force seeds that wouldn’t normally sprout by adjusting the amount of light, the temperature, the humidity, even the wind. We trick things into growing outside of their seasons, even outside of their regions. We grow them under cover to protect them. We grow them in planters to contain them. We grow them in cloth or plastic to give them more chances at life, for our sake. But life is undeniable. Even when it goes against our interests. There are very few times when a gardener is unhappy about things sprouting. 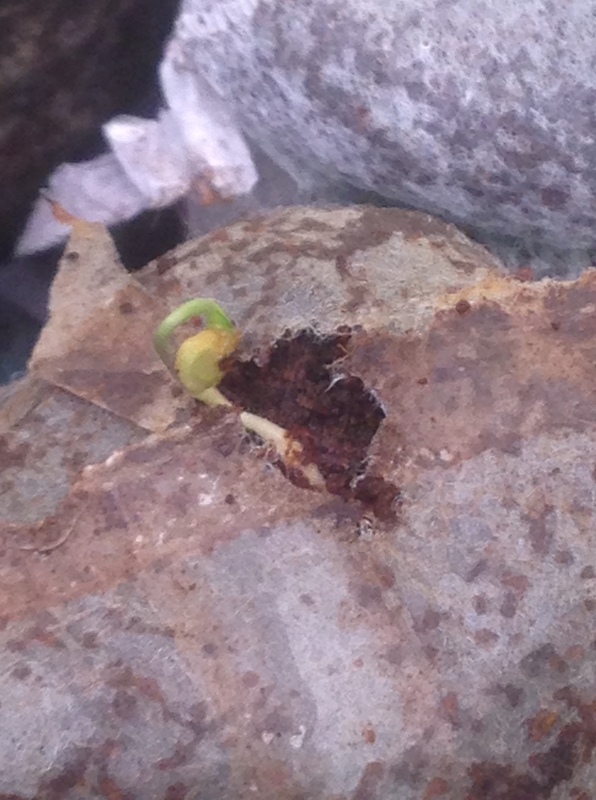 Sprouting means life. It means growth and promise and hope and bounty. Most of the time. 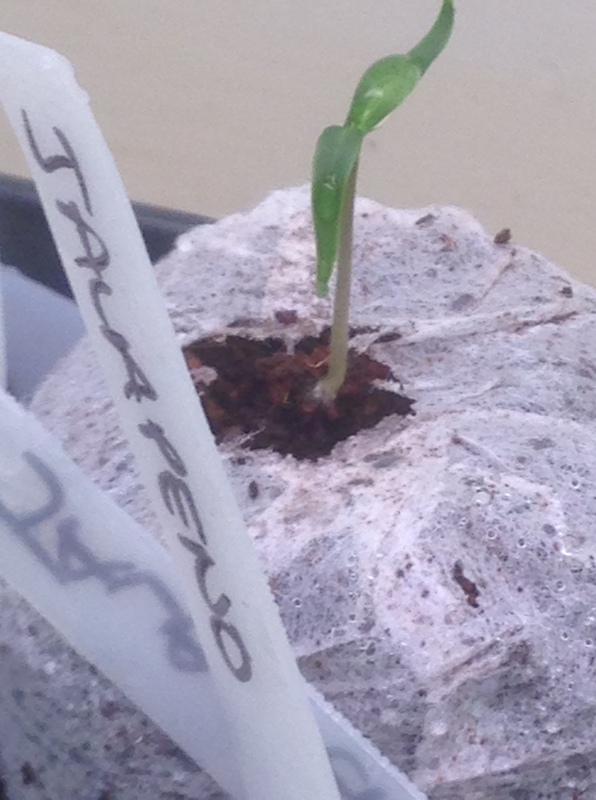 I’m weeping in my cup this morning because my garlic is sprouting. And I don’t mean the garlic that I intentionally planted in the garden last December. I mean my stored cache of cooking garlic that I cured last summer to last me all the long winter months and then some. Sprouting. Green. Bitter. It’s my fault, of course. It should have been kept in paper bags rolled tight to keep out the light. But for some reason I thought it would be nice to have it accessible in a basket in the kitchen, hanging from one of the rafters. I though it looked pretty. All the purple and white bulbs in a big pile ready to be chopped, diced, crushed, cooked and consumed. Did I mention I love garlic? I have unwittingly provided it with the right amount of daylight hours and what it believes are about 62 degree soil temperatures, so it has decided that now is the time to push out new life and reach for the sun. I have deceived it. What do I do with it now? If I do nothing, it’s taste will get worse and worse. It will eventually realize it has no soil, no water, no actual sun, and it will start to rot. But the garlic I planted last winter won’t be ready to harvest until July. That’s five long months with no garlic. But all is not lost, I think. It’s not yet too bitter to use. I could slit open each of the cloves and mine out the green shoot to use in stock. I could chop up the shell of each clove, press it and store it in olive oil in the fridge. I could even plant some in a box inside and see if it grows. But that’s a ton of work. Hours of work. Whatever I do with it, I’ll be crushing out it’s first hopeful bid for life. What’s the big deal, you’re asking yourself. Crying over some sprouted garlic? Get over it, you’re telling me in your head. Pull yourself together, woman, and go buy some fresh. It’s only about 5 bucks for three cloves of organic garlic. Times 40. In 2014 I went to the Connecticut Garlic and Harvest Festival in Bethlehem CT http://www.garlicfestct.com/ where I found people who celebrated garlic as much as I do. There I sampled many varieties of garlic and purchased several types to grow myself. Since then I have been selectively storing and planting my favorites for four growing seasons. This garlic represents four years of being on my knees in the heat of July, carefully lifting out the bulbs to cure them, and four years of being on my knees in December, fingers frozen as I poke the cloves down into the frosty soil. And over fifty months of garlic bread, garlic chicken, garlic vegetables, garlic shrimp, garlic aoli, garlic sauce. At least I have some still tucked away in the frozen earth, waiting for it’s proper time to make a play for life. And so I peel and chop. And peel and chop. And continue to peel and chop. And I remind myself, dear reader, that this is slow food. My fingers, sticky with garlic juice, are tarred with garlic paper up to the middle joint. My kitchen smells like, well, a really garlicky place. I’m doing this not because I can’t afford to buy fresh garlic. Not because I am a food hoarder. Not because I have too much time on my hands. It’s because this garlic represents my labor. My care. My intention. Even, yes I’ll say it, my love. I love this garlic. It matters to me. I am not willing to cast off the result of four years worth of effort and buy some anonymous garlic. I take pride in cooking with food I have grown myself. Surprisingly, I feel that my garlic has a certain provenance. It’s journey has become my journey. If you don’t already think I’m nuts, just keep reading. There is some concrete science that says that food grown in a certain place is symbiotic with the surrounding biome. The plants and animals (us included) that live in that place have a certain microbiota different from other places. Those microbes that are symbiotic with all life in that area provide tangible benefit for their hosts in the form of immune support and disease prevention. All this really means is that different places have different germs, and garlic you grow yourself in your own dirt might actually be better for you than garlic grown elsewhere, in different germy dirt. That’s one of the reasons we eat local, right? If you’re looking for me today, I’ll be in the kitchen creating my newest signature dish, winter sprouted garlic soup. I promise it will cure the sniffles with one sip. Ask me for the recipe! My dogs love to eat poop. My dogs especially love to eat frozen poop. Poopcicles. My dogs love to eat frozen poop and wipe their faces on the back seat of my Subaru. OK, stay with me people. This actually is about gardening and food and seasonal living. Sort of. So lets think about poop for a minute. I’m talking about horse poop, although I’m sure they would eat cow poop too, if we had a cow. The horses eat the grass. They digest the grass. That keeps them warm. Then the horses poop out the grass. It goes onto the ground and the worms come to eat it, and they digest it, and they poop too. (yep, Everybody Poops) THAT goes into the ground, making healthy soil, and the grass grows healthier. And the horses eat the healthy grass. The magic that is happening in this very specialized system that I have grossly oversimplified is called …..Drum roll please….Bacteria. Enter the Dogs. What is actually going on here is the dogs are capitalizing on a healthy system. They are trying to get something they need into their diet by eating the poop of other animals. It’s not because the poop tastes good, although it might. I wouldn’t know. Dogs, being carnivores, don’t have a ton of naturally occurring good bacteria in their guts, but horses do. That’s why we put their poop on our gardens. The dog eat the horses’ poop to get the good digestive bacteria. This is where it comes from! I just finished reading The Mind Gut Connection, by Emeran Mayer. I strongly recommend that anyone anywhere sick with anything read it immediately. Even though I know you all will, I’ll give you a synopsis anyway. The gut is larger than the brain and every bit as complex. The gut has trillions of microbes, including bacteria, in it. The microbes are our personal ecosystem. The Microbes (actually the metabolites they produce), interface with our brains. They control most of our hormones, as well as our immune responses. They can also produce cytokines when they are unhappy, which cause inflammation. Personal microbial stability = good health and emotional wellness. We must ‘farm’ our microbes to keep them healthy. I’m not saying we should be eating poop, although that’s fast becoming a treatment for certain illnesses. Just consider, the next time you stop for a doughnut and a caramel mocha latte, what is happening to your gut bacteria. The next time you have to take a Z-pak, realize that it’s wiping out all the good guys along with the bad. No wonder it gives you the runs. I know we all get sick, and the best treatment for severe bacterial illness is strong antibiotics. But remember that a healthy gut can (and does) wage war on invasive bacteria. Your personal army of microbes, if you keep it strong and healthy, will prevent you from getting sick in the first place. Once you’re there and you’ve been coughing for weeks, fever of 103, chest x-ray, and you’re gulping down those steroids and antibiotics and sucking on the nebulizer, it’s time to do some serious bacterial rebuilding. If you just plain refuse to eat poop (just kidding!) there are other ways to rebuild your internal microbial army. 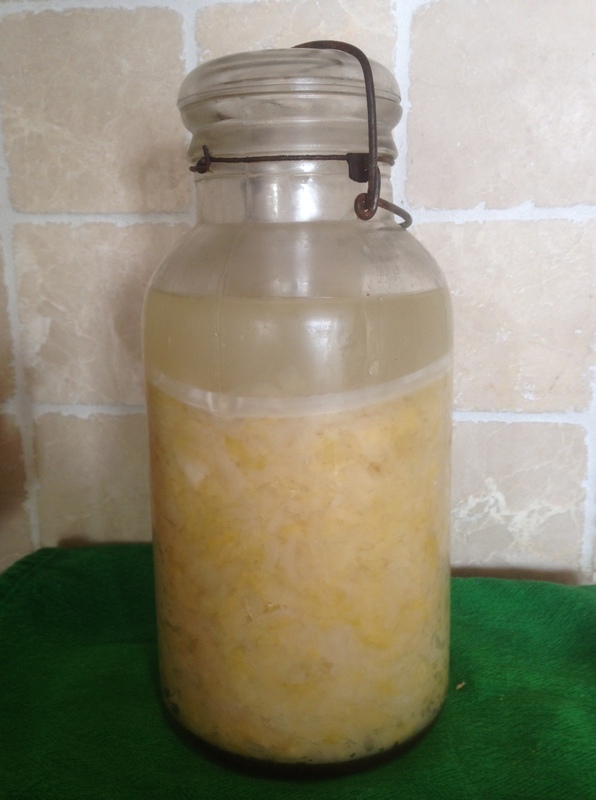 They are called FERMENTED FOODS. Kim chi, sauerkraut, pickles, yogurt, fermented cheese, kefir, kombucha, miso, tempeh, sourdough. These are some of the common ones available at the grocery store. Get them and eat them every day. Or ferment your own. It couldn’t be simpler. Put some vegetables in a crock with some salt. Cover them with water. Wait 4 weeks. Eat. It is actually that easy. So go forth my friends, and colonize your guts with healthy bacteria. Farm your internal microbes. Eat well, live well, be happy. Ah, January. One of my favorite months. Not only because its often snowy and sunny at the same time, like today, but because I don’t have to be doing doing doing every minute of every day. I’m speaking as a gardener when I say there is always something to be doing in the garden. Except in January. This is my down time. The time when I get to relax and just think about the garden. I can plan what steps I need to take in the spring. I can lay out my vegetables on my garden plan. I can shop seed catalogs. I can daydream about it, or not, but I don’t have to show up every day and get my hands dirty. Sure, there are other things to be doing in January, like shoveling snow, but I don’t feel the urgency of things needing to be done yesterday, the crisis of time passing while weeds are growing, that I feel in the warmer months. It feels nice to relax. It’s also wrestling season, another one of my favorite times. Well, not the wrestling part, actually, that isn’t terribly pleasant. The part I love is watching my 17 yo son kick some booty on the mat. That part is super fun. He’s really good. Since this blog is about gardening and eating (mostly), you’re probably wondering what is on the table at Winter Farm this snowy season. Well, we are enjoying the moose meat that my son, (also a world traveling hunter) brought back from Newfoundland this fall. We have a bunch of duck, goose, pheasant and venison in the freezer too. I’ve been having fun cooking from Hank Shaw’s cookbooks Duck Duck Goose, and Buck Buck Moose. https://honest-food.net/ He’s a terribly clever chef of wild game. So what am I doing with all my free down time? I decided to write a novel. Ha ha, I know. I can hear you all laughing. As you should. I don’t really know how to write fiction, and so I’m learning as I go. Playing catch up and realizing it is nothing like I though it would be. Hard work. I have a whole new respect for authors. Anyone out there with advice for a wannabe author?